Setting up a React development environment can be confusing and daunting to newcomers. You often heard developers saying different packages like babel, webpack, es6 and etc. are needed (not entirely true) as well. With React getting more popular, there are a fews boilerplate project aim to help developer create a suitable React development environment. create-react-app is one of the most popular starter template. The aims is to allow developers to create React app with zero build configuration. Developers no longer have to worry about how should webpack be setup, what should be configured with babel to use es6, which linter and test package to use. Everything will just work out of the box. Yes, is so easy! For developers who needed to touch the underlying configuration, it have a npm run eject that will allow developers to mess with the configuration and do what couldn’t be done previously. Only thing to note is, once eject is run, it cannot be reversed. The following guide aim to help developers build a Continuous Integration and Continuous Deployment stack for React app. We will be using CircleCI, CodeClimate and Heroku. If you do not have a account at any of the service above, head over to sign up one, is FREE!. Then browser should automatically open a page at http://localhost:3000/. If you see a Welcome to React page running, everything is good. We have to use node v6 because create-react-app only works with v6 and above. We override the test to run the option with npm test — —coverage to gather coverage report. 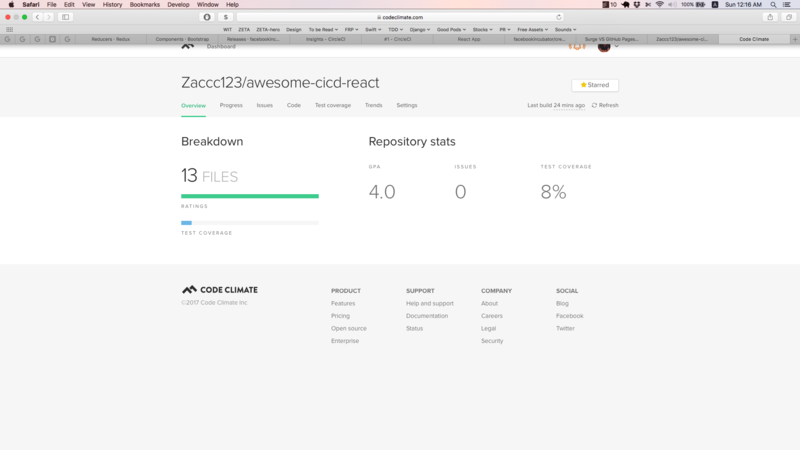 At the end, we install codeclimate-test-reporter to send the coverage report located at coverage/lcov.info to CodeClimate. This would push the project that we had created into the github. In order to use Test Coverage feedback, we will also need to copy the Test Reporter ID from Settings > Test Coverage and add it into CircleCI environment variable. In CircleCI, navigate to Project > Settings > Environment variable and add CODECLIMATE_REPO_TOKEN with copied id. 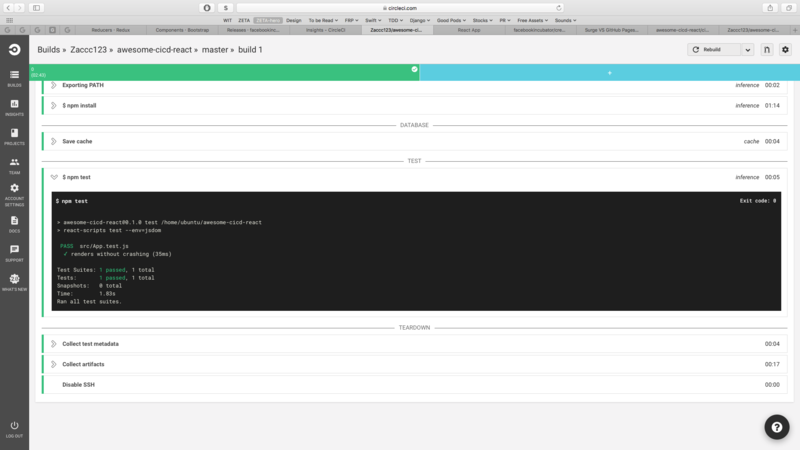 With a few setup, we have a fully automated continuous integration and deployment suite ready. Now with every commit that is pushed to GitHub, it will send a trigger to CircleCI and CodeClimate. Once the test passed, if it was on the master branch, it will also be automatically deployed to Heroku. View the sample repo here and the sample deployed website here !